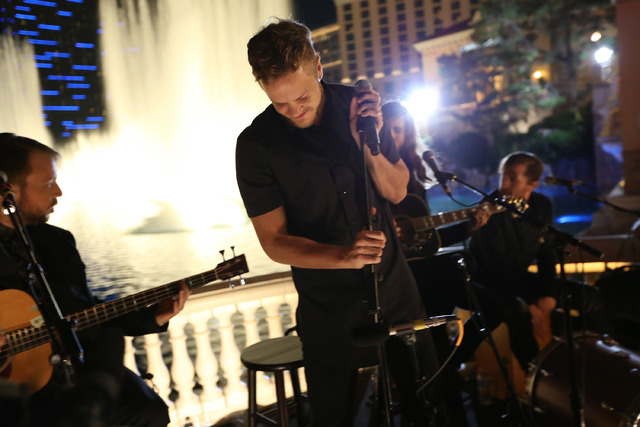 Remember when we told you Imagine Dragons was seeking superfans for a video shoot? That shoot appears to be a Grammy performance downtown this weekend. If you’ve driven around the El Cortez, you’ve noticed a big staging area under construction, cutting off traffic around Sixth and Seventh streets. Imagine Dragons will perform on that spot Friday (with an event launch of 4:30 p.m.) and again on Grammy Sunday (with an event launch of 4 p.m.). The fan sign-up site 1Iota.com has been looking for fans to be part of the video shoots, which will premiere the group’s next single. Last year, the Las Vegas band performed their Grammy-winning song “Radioactive” (a terrific, pounding sports anthem) in a mash-up with rapper Kendrick Lamar, while Taylor Swift did some kind of freaky alien-arms dance in the front row, not that I’m picking on Taylor Swift or claiming I haven’t always danced like an idiot too. I’m just being a descriptive truth-sayer. We are all sucky dancers together. Imagine Dragons has been very busy in town the past few weeks, promoting their new album “Smoke + Mirrors,” coming out Feb. 17.